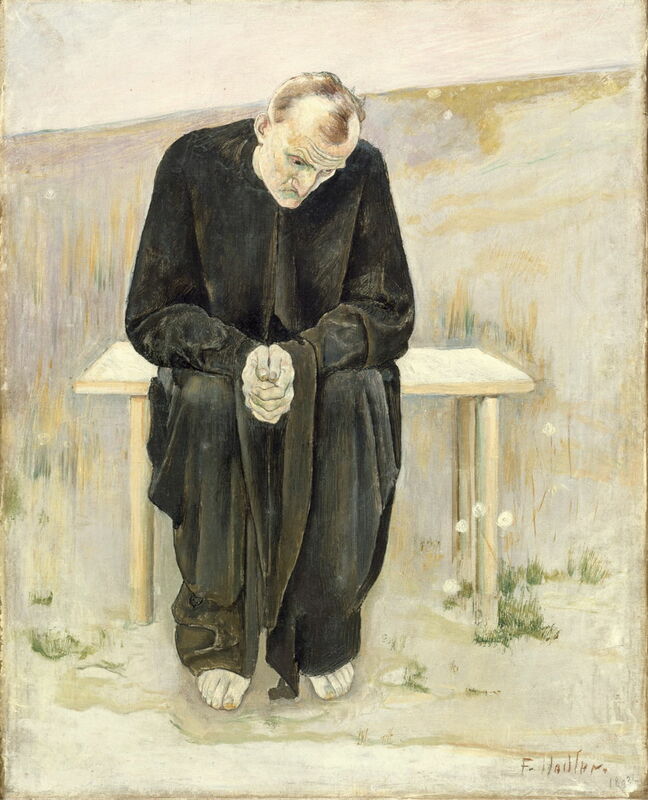 Ferdinand Hodler (1853–1918), The Disillusioned One (1892), oil on canvas, 56.2 × 45 cm, Los Angeles County Museum of Art, Los Angeles, CA. Wikimedia Commons. The first article in my series to commemorate the centenary of the death of the Swiss artist Ferdinand Hodler (1853–1918) showed some of his realist paintings from the early years of his career. During the late 1880s, he started to develop his mature style, a form of Symbolism which he referred to as Parallelism. It was also a period of great change in his personal life. In 1887, Hodler and his partner Augustine Dupin (1852-1909) had a son. Two years later, Hodler married Bertha Stucki, but they divorced in 1891. He met his future second wife, Berthe Jacques (1868-1957), in 1894. All three of his partners modelled for his paintings, although not, as far as I can tell, simultaneously. 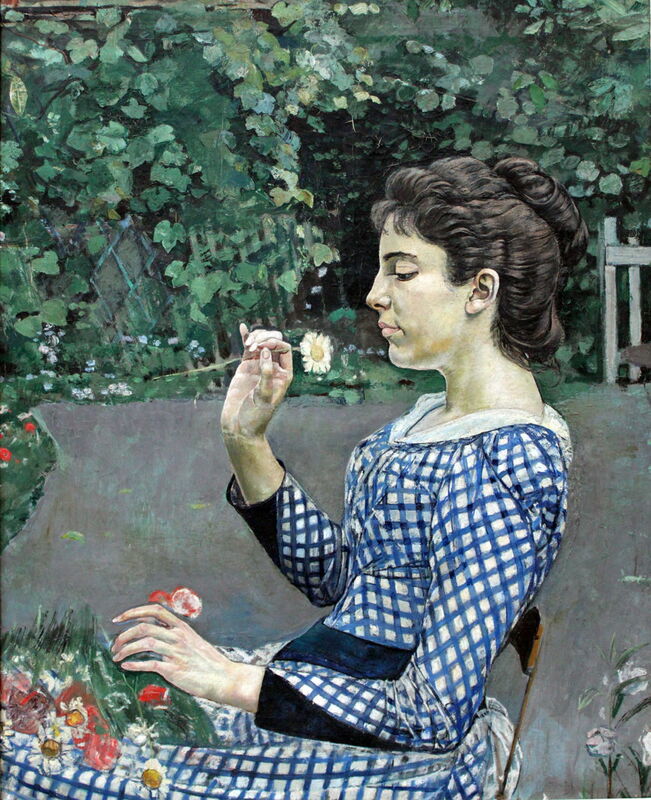 Ferdinand Hodler (1853–1918), Portrait of Hélène Weiglé (1888), oil on canvas, 88.5 × 69.5 cm, Städelsches Kunstinstitut und Städtische Galerie, Frankfurt, Germany. Wikimedia Commons. 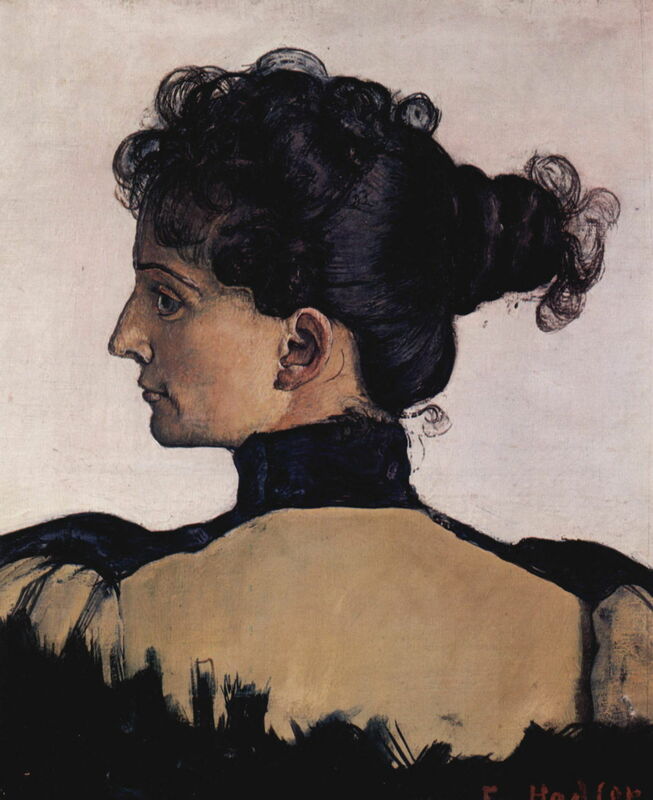 Hodler’s Portrait of Hélène Weiglé (1888) remains firmly rooted in his early style, but signs of his transition are starting to become apparent in the unconventional pose, and the separation of the figure from its surroundings. 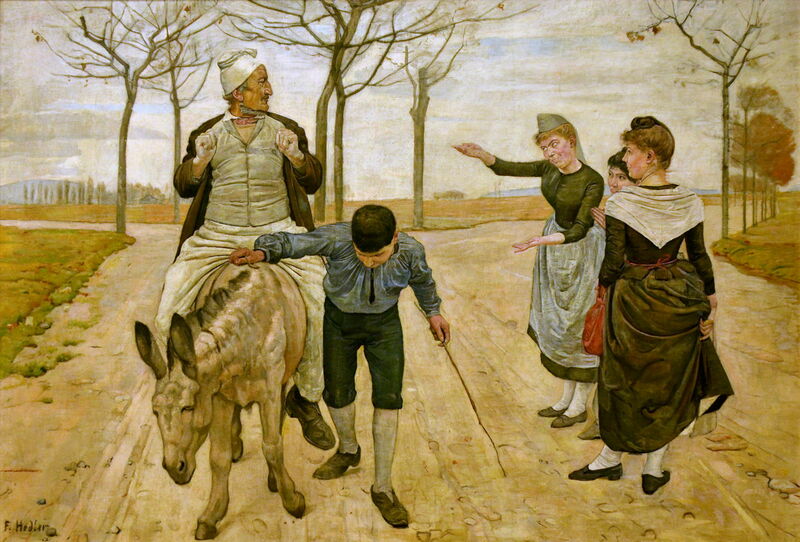 The Miller, his Son and the Donkey (c 1888) is a delightful depiction of this classical fable or folk story of a miller and his son who are repeatedly corrected by others for their treatment of the donkey, in particular which of the pair should ride the animal. At this point in the story, it is the miller who is being borne by the donkey, and his son who is driving the animal. Three women passing by are telling the miller what he should be doing, which is apparently quite different. The landscape background is very similar to others which he painted at this time, and remains thoroughly realist. Hodler’s painting The Boxer’s Procession was awarded a distinction at the Exposition Universelle in Paris in 1889, his first major international recognition. Night (1889-90) marks Hodler’s turn towards more Symbolist motifs. Four young men and three young women are sleeping outdoors, under black blankets. In the middle of the group, a black-cloaked figure is crouching between the legs of one of the men, who is alarmed; the figure represents death. This painting can therefore be read as telling the all too common story of early death among adults at the time, notably from tuberculosis and other infectious diseases, something that Hodler knew well. This painting was submitted for exhibition in Geneva in 1891, but was rejected as being obscene, so Hodler exhibited it in a separate building nearby, causing quite a scandal. The artist also submitted it to the Salon in Paris, where it received praise from Pierre Puvis de Chavannes and the sculptor Auguste Rodin. It was exhibited again at the Exposition Universelle in Paris in 1900, again to acclaim. Hodler wrote later that he considered this his first work to have been entirely his own in terms of conception and staging. 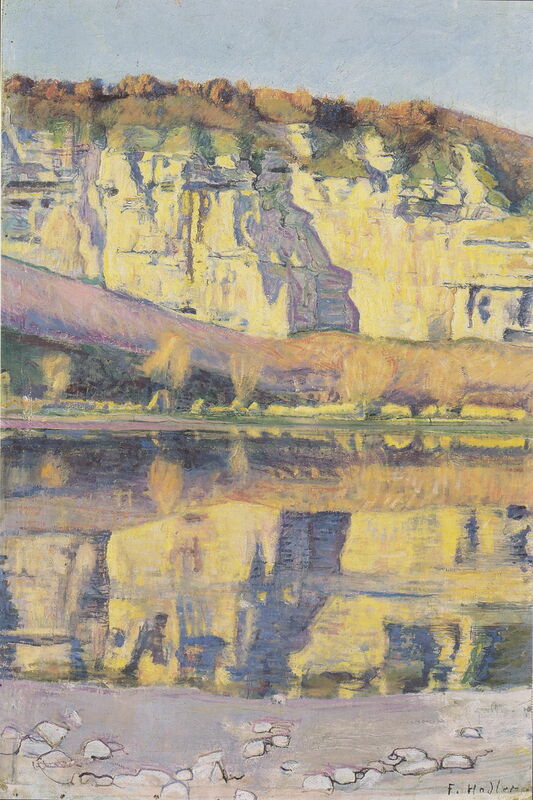 Hodler’s landscape motifs had shifted from the influence of Calame, and were exploring symmetry and rhythms in nature, as in The Road to Evordes (c 1890), above, and Bank of the Rhone (1891), below. Ferdinand Hodler (1853–1918), Bank of the Rhone (1891), oil on canvas, 56 x 39 cm, Bündner Kunstmuseum, Chur, Switzerland. Wikimedia Commons. 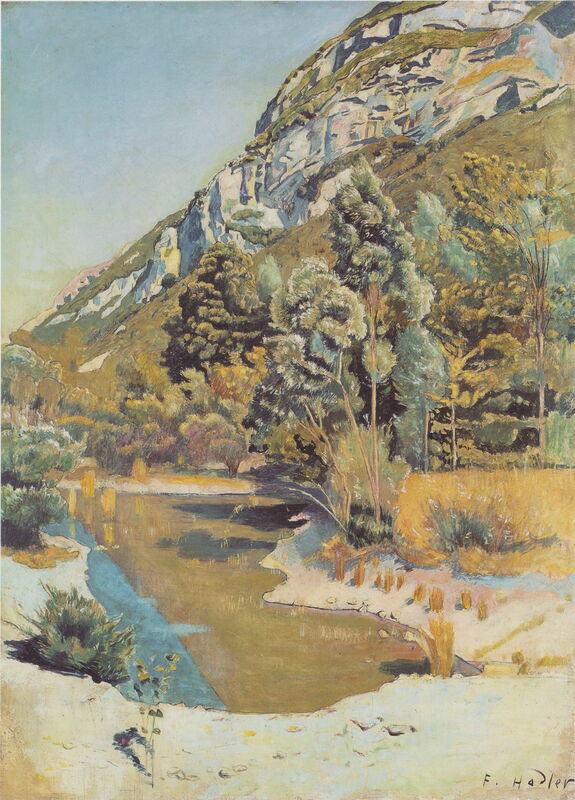 Ferdinand Hodler (1853–1918), At the Foot of Petit Salève (c 1890), oil on canvas, 71.5 × 52.5 cm, Private collection. Wikimedia Commons. 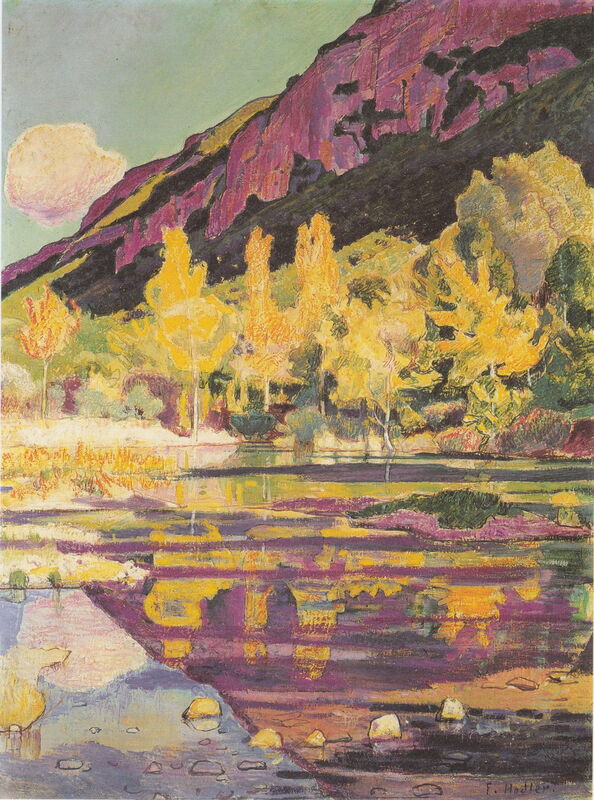 Hodler often painted the same landscapes repeatedly, although not in the same way as Claude Monet’s formal series. These can afford valuable insights into his changing style. Two particularly informative examples are identical views At the Foot of Petit Salève. That above was painted in about 1890, and that below in about 1893. 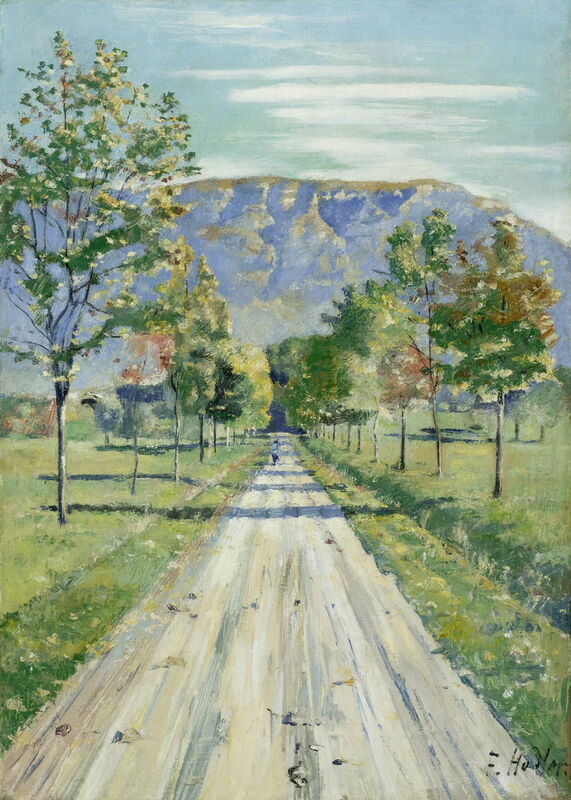 Ferdinand Hodler (1853–1918), At the Foot of Petit Salève (c 1893), oil on canvas, 65.5 × 49 cm, Kunsthalle Bielefeld, Bielefeld, Germany. Wikimedia Commons. 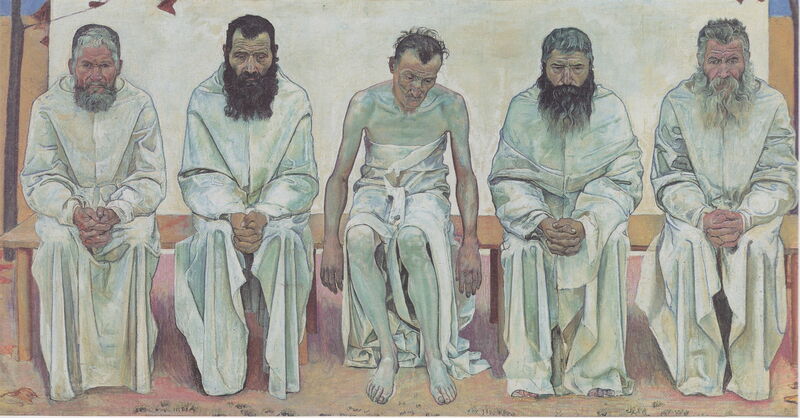 From 1891, Hodler worked on a series of paintings showing tired-out men. The World-Weary (1891-92) was another important early work on his road to Parallelism, with its emphasis on the symmetry and rhythms seen in society. He painted this from models who sat for him in a local cemetery during the autumn of 1891, and the finished work was exhibited in Geneva in 1892. Ferdinand Hodler (1853–1918), The Disappointed Souls (1892), media and dimensions not known, Kunstmuseum Bern, Bern, Switzerland. Image by Sailko, via Wikimedia Commons. The Disappointed Souls (1892), another in this series, also shows five older men, this time dressed in black robes and sat on a bench in barren fields similar to those seen in Night. It too was exhibited in Geneva in 1892. The Disillusioned One (1892) singles out one of the men, at the left end of The Disappointed Souls, and appears to have been one of his studies for the group. 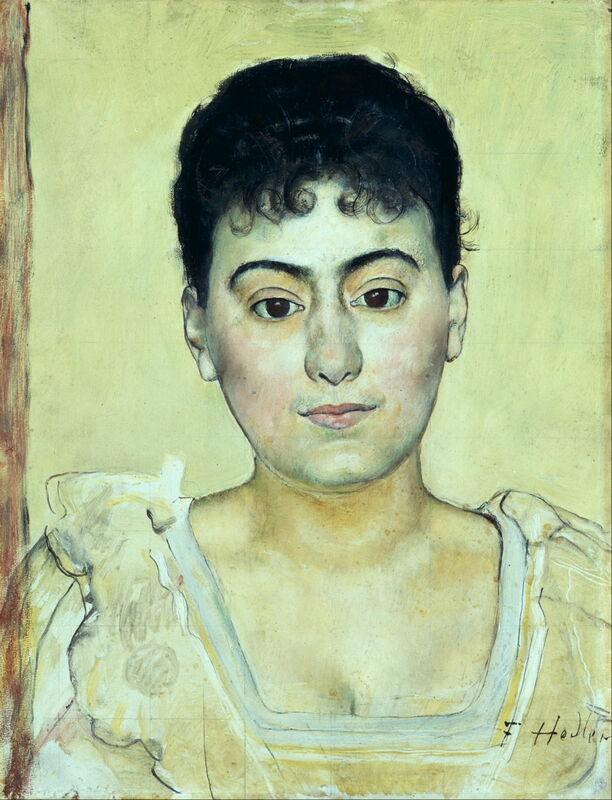 Ferdinand Hodler (1853–1918), Portrait of Madame de R (1893), media not known, 35 x 27 cm, Galerie Neue Meister, Staatliche Kunstsammlungen Dresden, Dresden, Germany. Wikimedia Commons. Hodler continued to paint portraits over this period. His Portrait of Madame de R (1893) shows how far his changing style had come from that of Hélène Weiglé just five years earlier. Ferdinand Hodler (1853–1918), Portrait of Berthe Jacques, the Artist’s Wife (1894), oil on canvas, 33.5 × 28 cm, Private collection. Wikimedia Commons. This Portrait of Berthe Jacques, the Artist’s Wife was painted in 1894, the year that they met, and is most unusual in her pose, facing away from the viewer, with her head turned in profile. 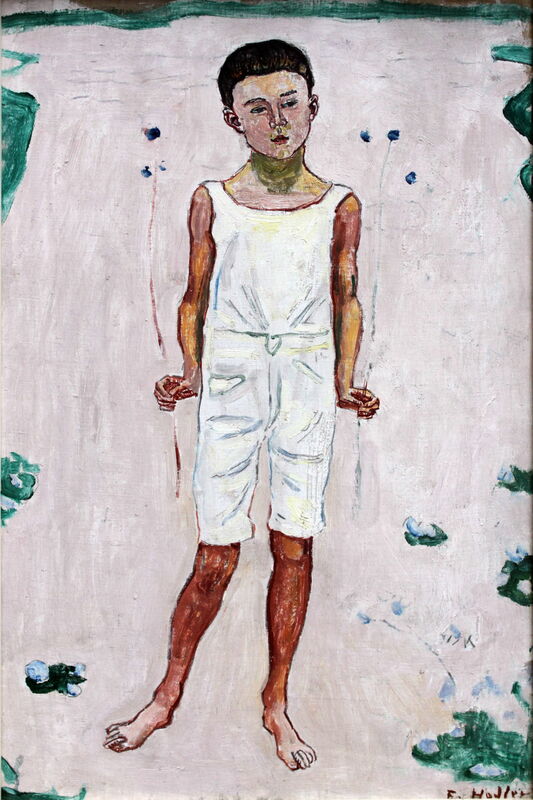 Ferdinand Hodler (1853–1918), Childhood (1893), media and dimensions not known, Städelsches Kunstinstitut und Städtische Galerie, Frankfurt, Germany. Wikimedia Commons. Hodler also started to develop lasting motifs based on standing children, as seen in Childhood (1893), or women, who formed into rhythmic and symmetric groups which are characteristic of his mature Parallelism. These evolved through several stages, and were often set in rolling meadows, which I will show in the coming articles in this series. Posted in General, Life, Painting and tagged Hodler, landscape, painting, parallelism, realism, series, symbolism. Bookmark the permalink. More about the fascinating and influential Hodler.